Finding a bag, case, or backpack for your DSLR camera can sometimes be tricky. Many photographers are very particular about their bags, and it’s easy to see why. You need something that will protect all your gear, withstand the environment you are usually in, and be comfortable to wear around. There are many camera bags on the market, and you can find just about any price point imaginable. We have a roundup of our favorite bags out there to help you narrow down your decision. 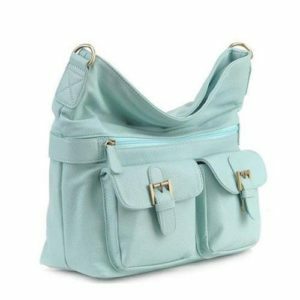 We have identified five styles of camera bags: shoulder bags, backpacks, sling bags, messenger bags, and purses. With your wish list in mind, we also recommend buying the best available in your budget. As a general rule, more expensive bags will be better made – they’ll be made from better material and have better stitching and more durability. Of course, we know that having a bag that’s fashionable is important, too, but tastes vary so widely it all comes down to personal preference. We did keep stylishness in mind in our review, though, and luckily there are plenty of options that look good while being functional. Without further ado, here are our favorite camera bags. Shoulder bags are not always the most popular camera bags, but they work well for plenty of photographers. These bags sit on one shoulder (and sometimes double as cross-body bags), so it’s important that they have padded shoulders to minimize discomfort. Shoulder bags generally aren’t as sleek as messenger bags, and they’re not meant for hiking or other outdoorsy activities like backpacks. So, they tend to be a bit bulky, but good ones will have good protection and plenty of pockets and slots for all your gear. Think Tank and Lowepro offer our favorite shoulder bags, and both brands have plenty of options for sizes and colors. While the Retrospective 30 is the most expensive of the three shoulder bags we picked, it’s well worth the money. It features plenty of storage space – the Retrospective 30 can accommodate a full frame DSLR and extra lenses. The manufacturer calls it “inconspicuous” and a blend of “old school” with new technology. These descriptions make total sense when you see it, but we’d also go so far as to call it stylish (in a utilitarian sort of way). It’s durable and sturdy with a rugged build and quality materials. Check out the other Retrospective bags for additional sizes if the 30 is more than you need for your gear. The Nova is not as stylish as the Retrospective, but it’s well made and features several options. It’s also less expensive than Think Tank’s. You have options for storage and carrying, as well as several choices of sizes. The Nova 180 is for compact DSLRs, but you can pick up larger sizes for bigger cameras or more gear storage. The Nova is weatherproof and features a flap lid for extra protection from the elements. It’s a bit boxy, but it has fantastic protection and will last a long time. If you do not want to fork out so many of your hard earned dollars, AmazonBasic’s line of goods has a gadget back that’s seriously budget-friendly. The compartments inside offer plenty of space and options for your gear storage, and are lots of pockets and slots for your extras. It’s not anything spectacular to look at, but it’s well made and functional. And you simply can’t beat the price. 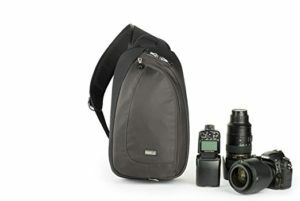 DSLR backpacks are awesome for photographers on the move. They are also an absolute necessity for outdoors photographers who need to have their equipment safe and have both hands free. 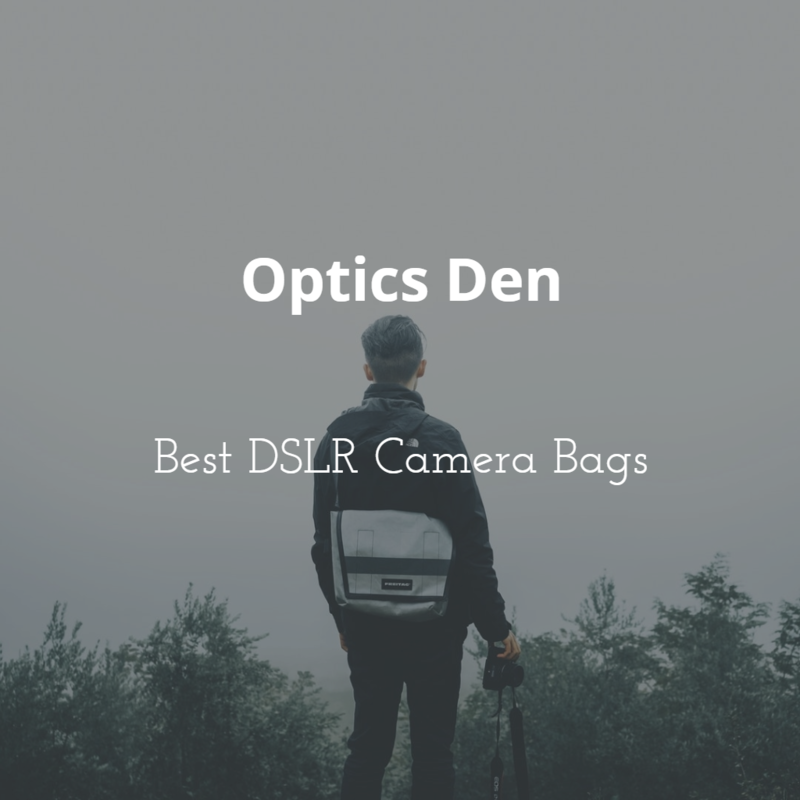 There are an incredible number of camera backpacks on the market, and you can spend hundreds of dollars getting some of the top of the line models. However, spending big is necessary if you need a backpack that can handle the elements and keep your gear safe and sound. The buzzy and award winning Peak Design has an everything-you-need-and-then-some backpack that pros can’t get enough of. While it’s a little spendy, you’re paying for expert design, well thought out engineering, and weatherproofing you won’t have to think twice about. One of the best things about the Everyday Backpack is how intuitive and functional the storage is. You get easy access to all the things you need. We love this backpack and think you will, too. While this backpack is designed with security in mind, it’s also a functional, well-designed backpack for an affordable price. The anti-theft features of the backpack are super useful for travelers – it is engineered with all the security components you’d need. This includes embedded wire mesh and RFIDsafe Blocking Material to help prevent hacker scanning. It also features a built in rain cover, lots of compartments for all your stuff, and a low profile. It’s perfect for travel or everyday use. We’re big fans of all of Lowepro’s camera bags. This one isn’t our favorite Lowepro overall, but its budget-friendly price and versatility help it land a spot on our list. The Hatchback BP 150 is designed for compact DSLRs, but it also easily converts to a standard daypack. This makes it even kinder to your wallet, as you’re essentially getting two bags in one. It features an all weather cover to help protect your gear from the elements and from dust. If you want a more comprehensive outdoor backpack, or you have more to spend, we recommend checking out some of Lowepro’s other offerings (the pro-approved Whistler BP is pretty amazing), but if you’re on a budget, the Hatchback is a fantastic option. 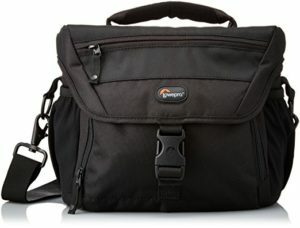 Messenger bags are a popular choice for photographers who want a stylish, comfortable bag that’s easy to access. The best messenger bags for cameras have pockets or inserts for your gear and for anything else you want to carry with you, like laptops or tablets, or keys and a wallet. 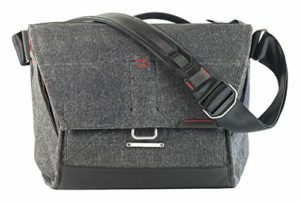 Peak Design makes their second appearance on our list with this smart, high-quality messenger bag. It’s a bit pricey, much like their backpack, but it’s well worth saving up for. 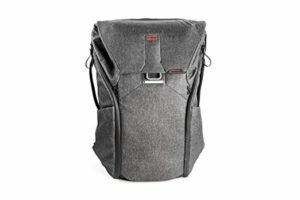 Peak Design worked with photographer Trey Ratcliff to create a functional bag that considers photographers’ needs. There are so many things to love about this bag – from its construction and usability, to its incredible attention to detail in organization configuration. Plus, its weatherproofing, comfortable strap, and rugged good looks, it’s a bag that will quickly become many photo grapher’s favorite. The Tenba Messenger DNA comes in several sizes so that you can find the perfect fit. The exterior is all-weather and rugged, making it a great choice for everyday use. The interior pays attention to the care and space you need for your camera and gear. The Messenger DNA also features an additional security strap so that you can wear it on your bike without the bag sliding around. The top has a quick access feature that makes it simple to grab your camera without opening the whole top. Price-wise, the Messenger DNA is priced well for an all-weather bag with inventive and useful features. Like our other budget picks, the Ape Case is best for a compact DSLR. Though the name says large, it’s really more of a medium-sized (or even a small medium) messenger. However, it’s very affordable and has a fun, functional look about it. It’s lightweight and contours to the body well, making it a good option if you want a bag that doesn’t call attention to the gear you have in it. It’s nicely priced, so if you are on a budget, this is worth checking out. Sling bags are not the most popular style of DSLR bag, but they are well loved by photographers who want a more compact way to carry their camera around. These are ideal for short hikes or day trips where you don’t need all of your gear and don’t want a bunch of extra weight on your back or side. Most sling bags are inexpensive; in fact, most are available for under $100, making them a good option for a backup bag. Think Tank makes it to the top of another category with this sling bag called the Turnstyle. It’s the most expensive sling bag we selected (though still under $100), but it’s worth the money for Think Tank’s smart design and sturdy construction. The Turnstyle features an option to be worn as a belt pack in addition to a sling, making it a versatile choice for active photographers. Either way you wear it, you can get to your gear quickly and efficiently. It also has water-resistant fabric and a removable rain cover. The Lowepro Slingshot is a smartly designed sling that makes getting what you need super easy. There is a small front pocket, for example, that has a space for your phone, plus separate space for other small essentials. All of the other access points are well thought out, and the Slingshot makes an excellent choice for travelers with compact DSLRs. You can quickly access the side pocket without taking the bag off, and the zipper placement makes it easy to get in and out of while also deterring theft. Lowepro is a fantastic brand for camera bags, and their Slingshot is no exception. You’ll notice we don’t have a budget pick for sling bags, and that’s because the Lowepro sling and this Ruggard sling are pretty darn close in price. The Triumph has a bit more room than the Slingshot, but it too has smart access points to quickly get in and out of the bag. The Triumph as a compact tripod holder and plenty of compartment options, making it an excellent option for traveling and keeping everything together. There are far fewer options for camera purses than any other bag type. This is probably because they aren’t practical for every photographer, nor are they very useful for many situations beyond walking around town. There is still some demand for them, though, so there are a few possibilities for a stylish purse that is designed to hold DSLR equipment. One thing to note, however, is that there aren’t many budget options, so you can expect to pay over $100 for a DSLR purse. The Gracie purse is a super cute option that has plenty of room for your camera and gear. There’s room enough for your camera body and a few lenses or other gear, plus pockets for other things. The Gracie bag is fantastic for travel – it doesn’t look like a gear bag and it conforms to your body rather than being bulky. The access points are easy to get into, and there are lots of options for storage. It’s also the least expensive option in this category. This tote doesn’t have great padding for the camera compartments, but it’s a real winner in the looks department. It features comfortable straps and lots of compartments, so it will work well for a stylish photographer who is on the go. It is practical and sturdy, so if you are looking for a bag that will function as more than just a camera bag, this is a fantastic option. There are several print options, too, so there’s sure to be one that matches your personality.